How To Invest In Real Estate Without Being A Landlord One of the simplest ways to invest in real estate is through a real estate investment trust. REITs generate income for investors by leasing commercial properties. As part of his quest to put $5,000 to work, NPR's Uri Berliner learns that what counts as real estate in a REIT keeps expanding. NPR's Uri Berliner discovers that among his REIT holdings is one that owns the Washington, D.C., site where, until recently, NPR had its headquarters. The building is being torn down and a new building with law offices will go up in its place. Reckless bets on real estate can cause trouble. They can, for example, help to bring down the global economy. But many financial advisers say including some real estate in an investment or retirement portfolio is a good idea. It adds diversification. And real estate prices are rising. Here's one way to tell: The house-flipping shows are back on cable. Buy, remodel, sell, repeat. We've been there before, and it didn't end happily. And yet prices fell so hard during the crash — 50 percent or more in some parts of the country — that a rebound just makes sense. Real estate watchers are divided on whether fundamentals justify further price increases or whether the market is getting too frothy again. Josh Dorkin runs a real estate investment website called Bigger Pockets. I asked him what kind of real estate bet I can make for $1,000. His advice: Be careful. "We're kind of in a bubble once again," he says. "We've got these low interest rates; we've got the big money funds coming into the market. And of course if you're savvy and know what you're doing, there's always going to be an opportunity." Dorkin runs me through my options. "You could go and flip a house. Of course, you'd need to go out and take out a high-risk loan more likely than not to do that and of course doing that is really kind of like running a job in itself." Curious about some of Uri's other REIT holdings? Storage units: When the housing market picks up, people move more often. They need someplace to stash their stuff for a while. They want more space, and they rent it from storage unit companies that are REITs. Data centers: Data centers are like unfurnished apartments for digital information. They're secure and climate controlled with plenty of reliable power. With more companies using the cloud, demand for these digital apartments is growing. "Other options include crowdsourcing or syndication." "And I think the final option is really to go out and buy shares of a REIT — real estate investment trust." REITs are sold like stocks, and they're held by many individuals and institutional investors. You might have a REIT in your retirement fund. REITs are trusts that own and develop property and earn rental income. Most of it gets passed on to investors. "They are forced by law — a law created in 1960 — that provides that real estate investment trusts have to meet certain tests," says Brad Thomas, editor of the Intelligent REIT Investor. "And if they do, they are forced to pay out 90 percent of their taxable income in the form of dividends." Those dividends are a regular stream of income, and they're what make REITs attractive to investors. In a rising real estate market, they're what clinch it for me. I put down $513.94 on a REIT index fund. It's basically a smorgasbord of many different REITs. It contains what you might expect — REITs that own apartment buildings and shopping centers. But Thomas says the range of REITs today goes far beyond that, "from billboards to prisons to cell towers, campus housing. Even solar is on the horizon potentially." With so many kinds of businesses seeking to become REITs, the Internal Revenue Service has begun reviewing some conversion applications to determine whether the companies truly qualify as real estate firms. In other words, are they really landlords? The REIT structure can allow companies to significantly reduce their tax bills. The fund I've bought only includes existing REITs, not firms hoping to convert to them. With that in mind I decide to check out some of my holdings — not online but in the physical world. Within easy driving distance from my house in Washington I find REITs in my fund that own and operate self-storage facilities and highly secure data centers that house stacks and stacks of server computers. In other words, the cloud. When I started out looking to invest in real estate, I never imagined I would wind up owning a little piece of the cloud. Or a stake in storage units. Or a bit of my former workplace. But it turns out that one of the many holdings in the fund I bought is a REIT called Boston Properties. Boston Properties, I discover on its website, now owns the site where, until recently, NPR had its headquarters. We moved out nearly two months ago. 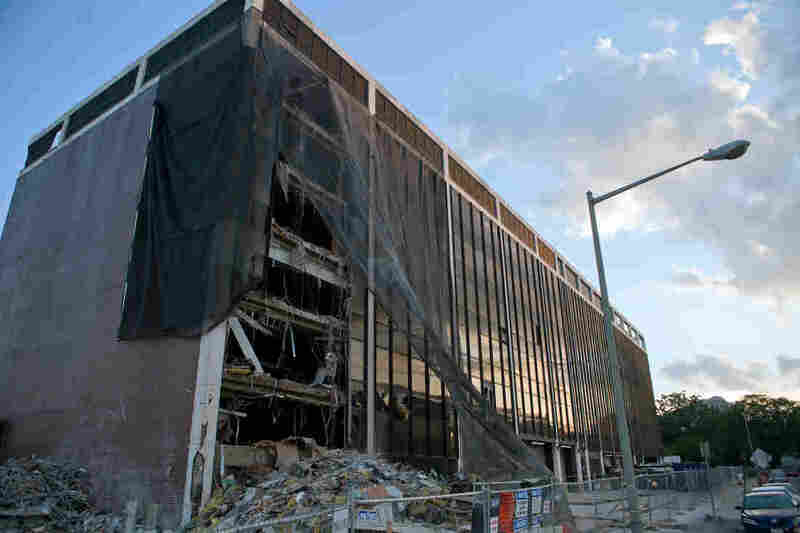 Now it's tearing the old NPR down, and a new building with law offices will go up in its place. Bulldozers are doing fast work. There's lots of debris around. I meet Larry Smoot, the superintendent on the job, and I ask him for a little keepsake from the old building. He comes up to me with a serious piece of real estate right in his hands. "This came off the Massachusetts [Avenue] side of the face of the building we're taking down," he says, giving me a heavy hunk of black marble. Nice guy. I didn't even have to tell him I was an investor.